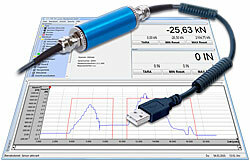 USB-Sensor Interface with freely available Configuration and Evaluation Software VS2. The Evaluation and Excitation of the connected Sensor occurs via the USB Interface of the PC. Sensors with Output Signals of mV/V, ±5V, ±10V, 0/4 … 20 mA, 10±10 mA or 12±8 mA are suitable for the Connection. Through the Measuring Rate of up to 5000/s, high-dynamic Measurements are realizable. This Measuring Amplifier is also very suitable for rough Industry Applications by the high Level of Protection IP67 of the Housing, It is also available as a Board without Housing which allows direct Integration in many Sensors.